Bloop Dooeh! Bloop Dooeh! Blooo blooo bloo bloop Dooeh! Look! Those creeps are doing the wave! Anyone who knows that sounds knows what Tower Defense is. Anyone who doesn't know that sound is quite the opposite, because once the apocalypse hits, they are pretty much screwed. That's right, play tower defense now, and survive the end times later. But what exactly is this “Tower Defense” I speak of. Not only have I established it as your ticket into post-apocalyptic society (date TBA, probably sometime after the apocalypse), it's also a really fun genre of game where you try to prevent bad guys from getting up a screen by building mazes that shoot blobs of ink at zombies, robots, kittens or some sort of demonic hellspawn like pink bubblegum or pencils. Consider it a reality simulator for something that will never come to reality. And for those of you who have played Plants vs. Zombies, Grave Defense HD or (appropriately enough) Desktop Tower Defense, you know the extreme life and death situations afforded in this genre. You know your creeps, your know how to create a maze, you know how to juggle vicious waves. And luckily, these skills are all quite useful if that alternate reality I decried as not real in the last paragraph becomes real. So while your friends and/or loved ones are busy being feasted upon by the unholiest of unholies, you're free to kick back and relax, because you play a pointless genre of games. Stephen King fans might even call this Dark Tower Defense. I realize the real world and the video game world are two completely different realms, and I've taken that into consideration in making these statements. I know in one you can totally flip out and kill anything that contemplates moving, while in the other you need a power-up to do that (lawyer ATTACK!). These different places have different rules, but there's one rule that trumps them all—survival. Thus, tower defense applies to the real world. To defend off the hordes of zombies/blobs/Steve Guttenberg films, you're first going to need a tower to defend. However, seeing as how this is not medieval England, and we're not all dying from plague, getting a tower might present quite the tall order, because towers are tall. 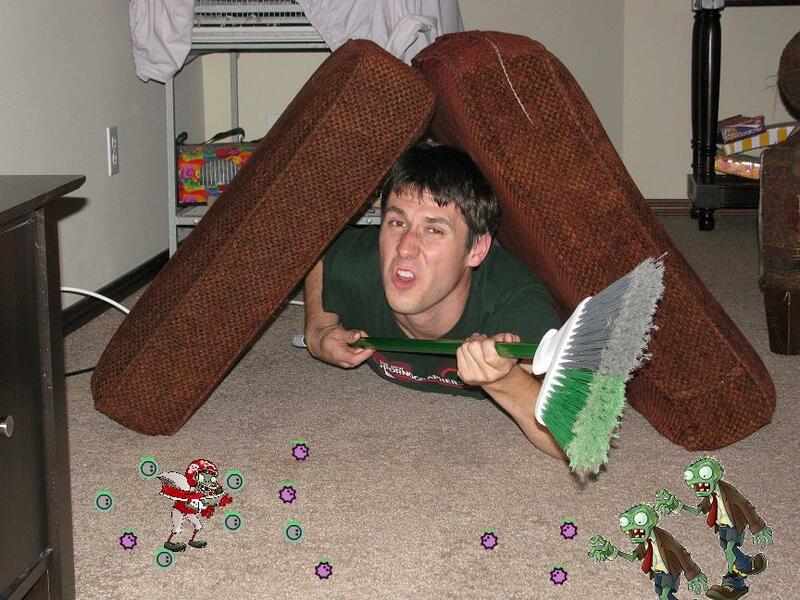 Don't worry though, tower defense can also apply to fort defense, and forts are easily obtained with properly placed sofa cushions. That steely snare is enough to defend this tower. The broom helps though. How do you set up defenses on your super sweet cushion fort? Unlike in the games, you can't just wave a magical mouse and bring about ink-blasting enforcers. 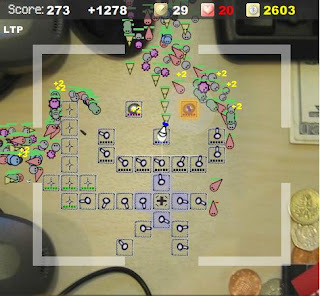 You need a bit of creativity to bring that part of the tower defense fantasy to life. My resolution is to just procure a bazooka and blast away from inside your fort. A broom also works. Oh, what's that you say, police officer, it's a crime to fire a bazooka in a residential area, no matter how certain I am of the apocalypse having already occurred?... that one I might believe him on, because no mutant freak could be that articulate. Climb the tower and get on this defense platform. Although that police officer seemed doubtful of my apocalypse claims, he'll soon wish he had my tower defense skills.